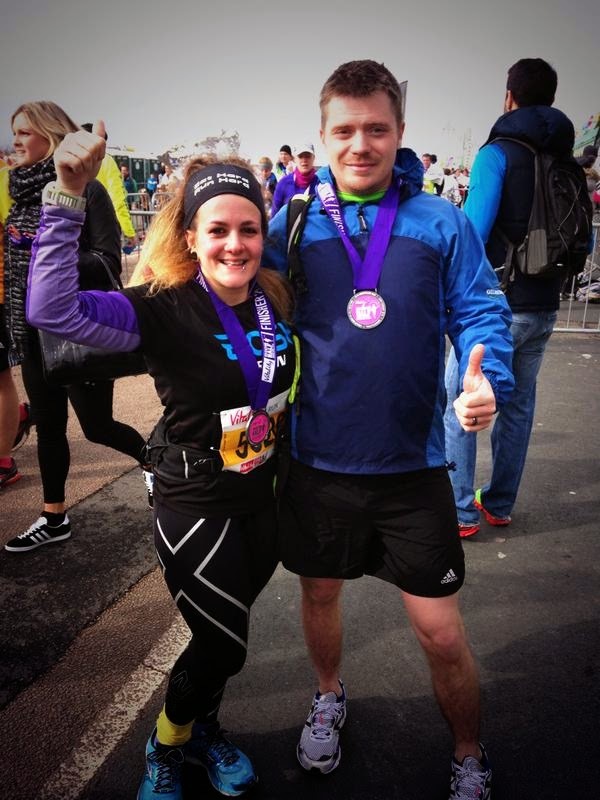 I was meant to write this yesterday whilst still basking in the glory of my 7minute PB at Brighton Half (more on this later), but I couldn’t sit still for long enough to write it as my legs were screaming at me and the foam roller of doom beckoned. #PBproblems. I’ve got a 10 o’clock start today (hurray for flexi-time) so if you’re lucky and I don’t procrastinate too much on Twitter and Facebook I’ll be able to get this written and published before I leave for work. I’m leaving the bike at home and treating myself to a walk in, to loosen the legs up and get a bit longer on Rivers Of London on Audible. (Great book, you have to read/listen to it). As me and the hubs cracked open the Cab Sav last night and toasted our amazing day of running, racing and epic refuelling (roast dinner and sticky toffee pudding for lunch, pizza and chocolate for tea – clean eating starts again this week! ), we started to talk about why we love to run. For me, whenever someone asks me that question I turn into an excited child, proclaiming my undying love for it; big grin plastered across my face, eyes darting around the room and hands waving all over the place as I try to put into words what it means to me. Nothing gives me that high like putting one foot in front of the other in the wonky way that I do. I do/have done a lot of other fitness stuff – cycling, climbing, swimming (work in progress), bootcamp, even boxing – and yes, stepping into that ring was the most terrifying, and exhilarating, and awesome experience of my life; but my heart belongs to running. Those lovely, awesome endorphins that stay with you for hours afterwards. I love to run for so many reasons, and trying to articulate them into a coherent sentence or blog post is actually proving quite hard, but I know that it comes from something inside of me, if that makes sense. Like it’s in my soul. I run to think, to have some ‘me time’. But then I also run to be part of the community – to chat to others, to share those races with BOSHers and Twitter friends, and those tough, hilly and beautiful miles across the hills of the South Downs with fellow RunBrighton members. I run to get outside and appreciate this gorgeous city we live in. But then I also run on the treadmill staring at a screen some lunchtimes for a quick interval-fuelled endorphin fix. I run to compete with myself, to better myself, to get that wonderful PB. But then I also run just for the sake of it, without my watch (alright, only very occasionally), to be free of pace, and time, and structure. But then it’s just so easy when it works. Sometimes it hurts, gives you blisters, pulls your tendons, injures your knees. But then it’s always worth it, in the end. Always. Mundane tasks like cleaning the kitchen become much more enticing when you’re staring at the beginning of 16+ long slow miles on the training plan. But when you stop procrastinating and get out there and get it done, you wonder why you were so worried. That was AWESOME. I asked people on Facebook (members of BOSH Run) and Twitter why they run, and so many brilliant replies came out of it. 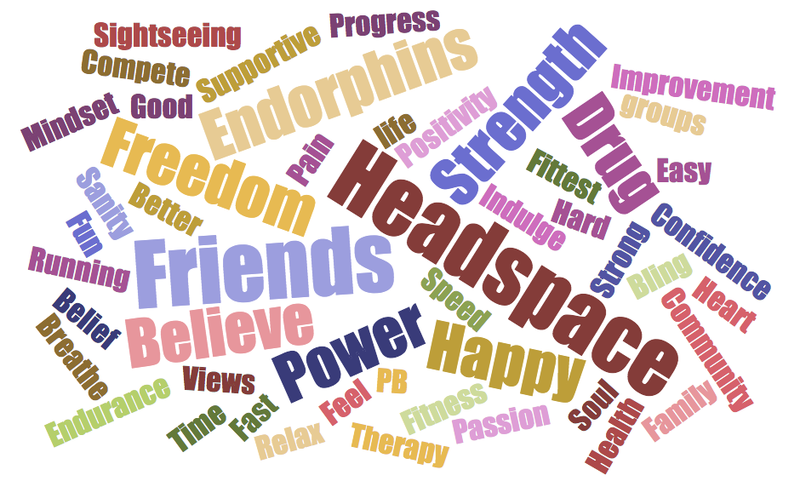 Just look at all these words, who wouldn’t want to run when this is why we do it?! Why do you run? Tell me… tell me everything!